It can be challenging to afford a diet that is 100% organic, especially when it comes to the produce section of the supermarket. (Have you seen how much they want for a tiny basket of organic raspberries?) So, how can you eat the recommended 6-7 servings of fruits and vegetables a day without breaking the bank, and without exposing yourself to dangerous pesticides? Help is here. 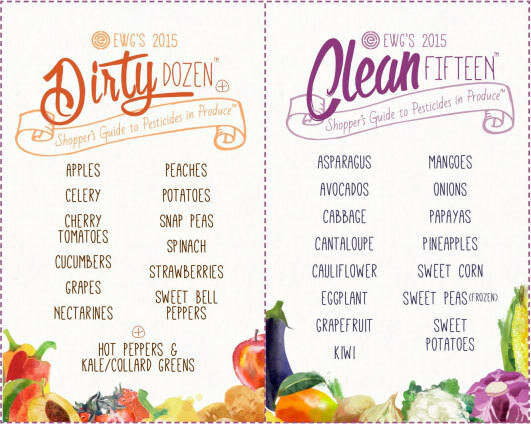 The Environmental Working Group released its annual Shopper’s Guide to Pesticides in Produce that tells consumers which fruits and vegetables have the highest concentration of harmful chemicals, and which are relatively clean (but still have some pesticide residue). They publish two lists, the Dirty Dozen, and the Clean Fifteen. Rankings are based on data gathered by the USDA, which measures pesticide levels in produce that has been washed and peeled, just like you would prepare it at home. Some sampled items had very low rates of pesticides (here’s looking at you, avocados), while others, like grapes and bell peppers had 15 different chemicals! These lists can help you make informed choices about the produce you buy. Save a few dollars on conventional asparagus and onions, but, whenever possible, spring for the organic strawberries. The answer is, not so much. 99% of apples tested had pesticide residue. In fact, apples claimed the top spot on EWG’s list for the fifth straight year. The next-worst offenders were peaches and nectarines. Conventionally-grown potatoes have more pesticides by weight than any other type of produce tested. If you haven’t already made the switch to sweet potatoes, now would be the time to do it. Sweet potatoes outshine potatoes in basic nutritional value, and they made the Clean Fifteen list. The EWG recommends that people who eat a lot of kale, collard greens, and hot peppers, buy organic. Even though these did not meet the criteria to be ranked in the Dirty Dozen, they contain trace amounts of pesticides that are highly toxic to the human nervous system. Cooking can reduce the concentration of pesticides in these foods. Are you concerned about the amount of pesticides in your food?